Summary: From the critically beloved, bestselling author of The World We Found and The Space Between Us, whom the New York Times Book Review calls a “perceptive and . . . piercing writer,” comes a profound, heartbreakingly honest novel about friendship, family, secrets, forgiveness, and second chances. I am such a big fan of Thrity Umrigar's. Not only do I appreciate her writing, but I absolutely love how she creates such memorable characters. She also seems to tackle some interesting issues in her stories. 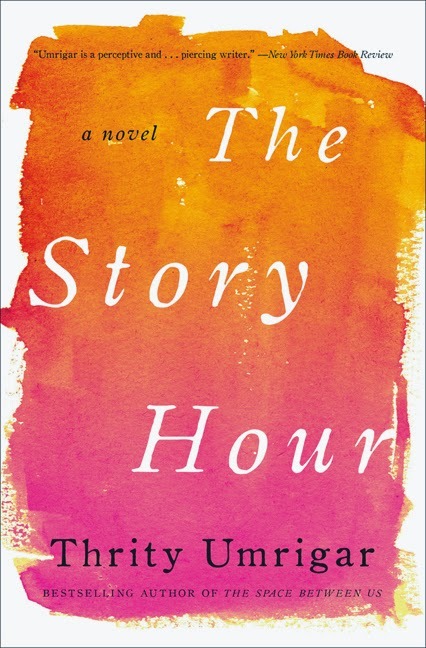 In her latest novel THE STORY HOUR, she once again wrote a compelling story with interesting characters, but she also managed to make me both think and feel -- all signs of a fantastic novel. THE STORY HOUR tells the story of two women, Maggie and Lakshmi. Maggie is a psychologist who takes pride in the way she deals with her clients; however, when she meets Lakshmi, she finds that her professional demeanor is much more relaxed. Lakshmi recently tried to kill herself because she believes her life is hopeless. Her husband is controlling and doesn't seem to love her, and her world is limited to working at their restaurant and grocery store. Naturally, Laksmi's husband doesn't approve of Maggie; and he quickly informs her that they don't have they money for Laksmi to see Maggie. Maggie then offers to treat Laksmi at her home for free. Laksmi opens up to Maggie and it becomes clear that Laksmi is lonely and needs a friend and personal freedoms... not a psychologist. Maggie and Laksmi's friendship grows and the two women begin to open up to each other. However, things get complicated when both women have different expectations of the friendship. As they share their "stories" with each other, Maggie begins to question if she really ever knew Laksmi. Maggie is disgusted after she learns that Laksmi isn't as innocent as she first appeared, and Laksmi tries to get revenge on Maggie by breaking up her marriage. Their trust is broken and the friendship seems broken beyond repair. Maggie and Laksmi both have to face the difficult choices they made as they struggle to fix their own lives. I really enjoyed THE STORY HOUR and it was everything I hoped for it to be. I love Ms. Umrigar's writing and it was especially smart in this novel. I hope I expressed how interesting the plot was in my description, but it was how she presented these two women's stories that made the book even better. The chapters alternated between Maggie and Laksmi's stories, and I can definitely say that the author managed to capture the individual voices perfectly. I especially appreciated how Laksmi's stories were told in Laksmi's "voice," and I could almost hear her telling them with her accent and broken English. I also really liked how Laksmi told stories from India -- about the elephant, her sister, and her family. It allowed me to understand her more fully and see how much she was missing by living in the United States. In addition, I appreciated how THE STORY HOUR managed to delve into some very complicated issues. Maggie and Laksmi were very different women in many ways from culture, to race, to education, to upbringing, to values, and more. By juxtaposing these two women's stories, the book really demonstrated the differences in these two women, but it also showcased some of the misunderstandings and assumptions we all make when it comes to those who are different than us. I also really enjoyed how the author showed the plight of an immigrant in our country. Like many Americans, I tend to take so much for granted; and I never really think how hard it would be to move here from another country. I loved how, through Laksmi, Ms. Umrigar showed the loneliness and isolation she felt. It was a huge eye-opener and one that definitely made me think. And that brings me to what I loved most about THE STORY HOUR -- how this book made me think... and feel. I was so touched by both of these women; and while I can't say I always agreed with their actions, they were very genuine and I wanted them to find some peace and happiness. My heart went out to both of these women, but especially Laksmi. She was so lonely and desperate and her lack of self-worth put her on a vicious downward spiral. I could just feel her pain and utter desperation, and it truly broke my heart. THE STORY HOUR would make an excellent book club pick. Unfortunately, I wasn't able to find any discussion questions; however, I'm sure you can tell that there are many issues to discuss. Some of the themes you might want to explore include race, cultural differences, friendship, mental health, marriage, adultery, family, betrayal, secrets, memories, love, support, second chances, trust, forgiveness, and redemption. Update: Here's the link to the discussion questions. I loved THE STORY HOUR and it's honest portrayal of women, friendship and different cultures. Highly recommended. I've only read one of Umrigar's books - I adored it so you'd think I'd have run out and read the rest. This one sounds so good to me. I've been hearing such good things about this book. I have it on my bedside table TBR stack. I need to move it up in the queue!